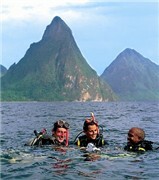 With the peaks of the Pitons towering above its landscapes, St. Lucia delivers a tropical island experience that combines natural beauty, outdoor adventure, watersports, shopping, history and local culture. It's a popular port call for cruisers on a southern Caribbean itinerary. Freelance writer Ginger Warder recently returned from a visit to this lush and captivating isle. She offers eclectic day-trip ideas for cruisers arriving at this destination on a port call. So let's explore paradise with Ginger.